The Indian highway is an unpredictable place. It throws at you a series of unexpected challenges almost without a break. There'll be people crossing without a warning in the middle of nowhere. All manner of animals will dart across suddenly. And you'll find vehicles that cannot get to 40kmph along with vehicles straining away at their 150kmph top speeds. This is on roads that vary from concrete to tarmac, from fresh and smooth to old and lumpy. We are also in the midst of a massive infrastructure expansion which also means the regular interruption of diversions around six-laning or highway construction. Wow. Stressful. Or not. Rishaad's ahead of me, the small profile of the Z800 looks even smaller from twenty bike lengths away though his Rynox saddlebags (see review in the product review section) do give the small Kawasaki sport-naked some heft. In my mirrors, I see the distinctive twin-LED headlamp threat of Kawasaki's Z1000 with the equally languid Alan on top of that outlandish machine. I'm in the middle on the Ninja 1000, mechanically the same motorcycle as Alan's Z1000 but made with a sport touring role in mind. We are out on the highway outside Pune, intending to cover, collectively, a thousand kilometres in the real world before handing the bikes back to Team Green. 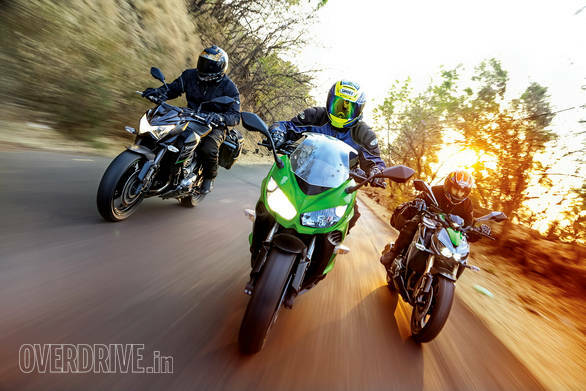 The world is blurring by smoothly at about 120kmph, a speed which all three Kawasakis are running at about halfway in the rev band with a lovely, quiet inline four roar. For the moment, at least, there is far more pleasure than stress. Alan, of course, has the nicest sounding motorcycle. "I love the growl of the intake when you get on the throttle," he says, "Kawasaki tuned the airbox specifically for this and despite the quietness of the exhaust, that intense roar is addictive." 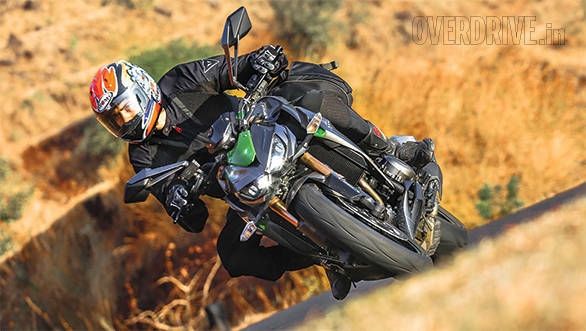 The Z800 couldn't be more different, "The Z800 also has a likeable roar when you're on the gas, especially at high revs, but it isn't as savage sounding as the Z1000 at all. Instead, there's a quietness to its voice that I really like. It sort of serves to highlight how smooth and refined the 806cc engine is," says Rishaad. 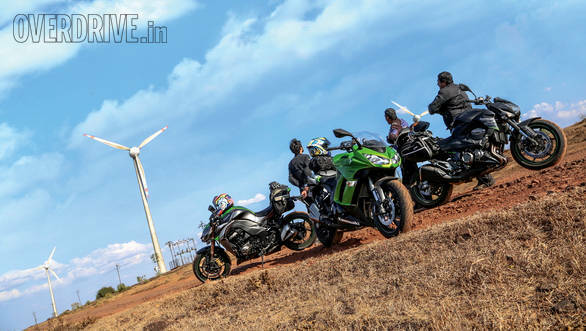 The Z800 features a 16 valve DOHC 806cc inline four that makes 113PS at 10,200rpm while peak torque is 83Nm at 8000rpm. The smallest motorcycle here, the Z800 sits on a 1,445mm wheelbase and has a kerb weight of 231kg. My motorcycle is somewhere in the middle. The Ninja 1000 doesn't have the roar or the quietness, but it does sound like a proper inline four all the time. And it would, the engine is the same as the Z1000, a 142PS, 1043cc four, but it weighs the same as the Z800 and has the same wheelbase as well. The steering geometry, though, is a bit more relaxed than the Z1000 and it has more suspension travel too. As in I'm more interested in what it does than what it sounds like. What it does is pretty special. Within about 50km of leaving Pune you hit a stretch of the highway where the top surface has eroded. It isn't potholed (yet) but you're constantly hitting the sharp, almost vertical bump as the tyres descends from the new surface to the old one and then within a few centimetres, you hit another sharp bump as the tyre has to climb back up to the new surface. The Ninja 1000 takes no notice of this. Its suspension absorbs most of this punishment while allowing me to sustain my speed with comfort. I can see the Z1000's LED lights going up and down by a dramatically larger amount. Alan's gamely keeping up but if this was the end of the day's ride, the stiff ride of the Z1000 would make it hard work. 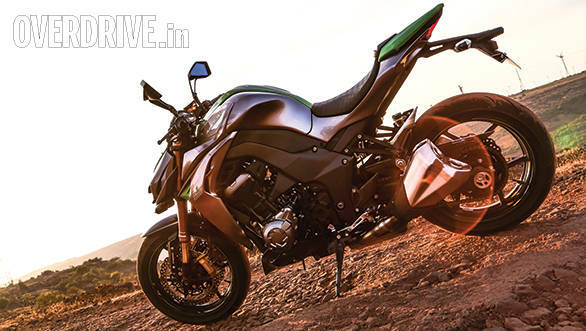 "You know the Z800 is sort of like the Ninja 1000, but is lighter on its feet," adds Rishaad. This allows the Z800 to use a stiffer setup but still come pretty close to how absorbent the Ninja 1000 feels. Yes, but I have traction control as well as riding modes. Then Rishaad passes me and begins to pull steadily away. 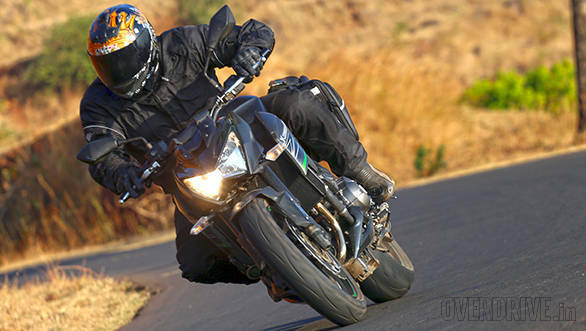 "The Z800 is so light on its feet and flickable that it gives you great confidence. So after the first few corners, you realise you can brake quite hard if you have to, changing direction is effortless and your sense of control over the Z800 is fantastic. The absorbent ride also means that when the tyres find a bump in the middle of a corner, the suspension deals with it rather well." And once again, poor Alan is third. "Hey, I caught y'all on every straight but I have to back off more for corners and the changing camber does make the Z1000 a more violent motorcycle in terms of feedback. It takes quite a bit to process all that and figure out what needs to happen next." Of course then we hit a stretch of wide open sweepers with no traffic and a freshly laid surface. With a big roar, the Z1000 pulls into the lead and Alan may or may not have had some air under his front tyre at this point. "The Z1000 can be huge fun. It isn't just a brutal bruiser of a motorcycle, but it does have a naughty streak. It's very, very quick to gather speed and if you're, um, lucky enough to find a crest in the middle of this, waa-hey-ee, small power wheelie." The specification explains the behaviour quite easily though. The engine is a 16 valve DOHC 1043cc inline four that makes 142PS at 10,000rpm while peak torque is 111Nm at 7,300rpm. This being a new motorcycle, Kawasaki has managed to make it 10kg lighter than the Z800 - it weighs 221Kg while the wheelbase is also 10mm shorter at 1,435mm. The day passes quickly. At some point we swap bikes to see what's what and I discover that the Z1000 is a beast. It goes exactly the way it looks. It's menace is more than visual. 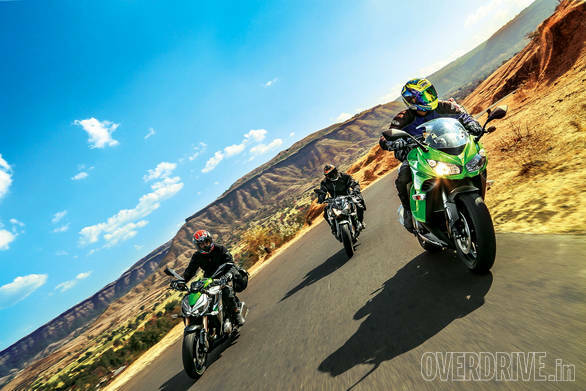 Given a smooth road, the Z1000 is the quickest of all three here by a quite a margin. And that intake roar is to die for. Record it carefully and put it on the iTunes store, I say. The Z800, on the other hand, is a peach. 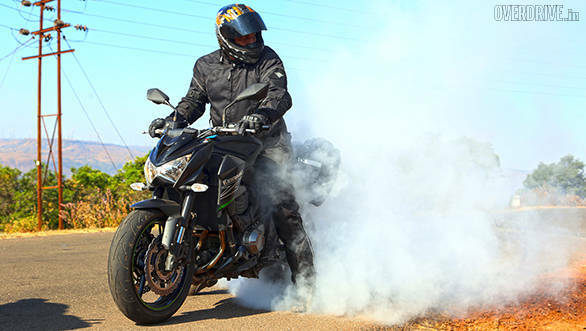 If the Z1000 is the boy from school who is always sneaking a smoke behind the building, the Z800 is the boy everyone thinks will get top marks in the exams, plays the guitar and is a quiz whiz as well. It makes enough power to keep up, not enough power to frighten new riders. It absorbs the roads quite well and feels tiny and controllable which makes the transition to big power and big engines very easy for new riders. Alan rides the Ninja 1000 and comes away smiling broadly. "I really like the N1000," he says, "It's the most comfortable of this lot. Despite the faired look, the bars aren't too far away and the pegs aren't too far back either. The screen allows you to sit at high speeds for as long as you like. On both the others, a sustained 140kmph is a literal pain in the neck. Plus there is more space on the N1000 to sit and then there's the safety net of traction control." Parked for the night, sweaty gear swapped for shorts and tees, the discussion continues late into the night. At dawn, it's time to head back. The Z1000's keys are the last to be picked up and that's telling. Alan manages to snag the Ninja 1000 and I have the Z800 which leaves Rishaad with the Z1000. We don't pity him, but he clearly is going to have both the most powerful motorcycle as well as the hardest ride ahead of him. "You're both growing old," he says helpfully. Perhaps we are. But the facts go like this. At Rs 8.77 lakh on-road Pune, the Kawasaki Z800 is not only priced well, I think it gets my vote for least intimidating non-Harley big motorcycle on sale in India today. It allows you to play with more power, offers you four cylinders worth of fun while giving you enough leeway, room and confidence so you can build your skills and comfort level. You'll enjoy owning it and you'll enjoy riding it. The Z1000 features minimal body work but with good attention to the smaller details. 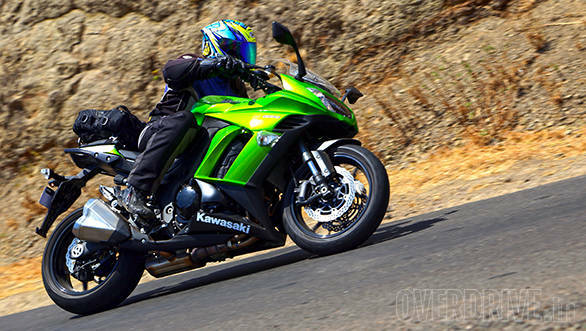 At Rs 13.82 lakh on-road Pune, the Z1000 is a bazooka. It packs massive firepower but it requires a steady hand to wield it. Set up stiffly and with aggressive steering geometry as well as instant throttle response, the Z1000 is very satisfying to ride hard down a fast, smooth road but on the flip side it also can't absorb big bumps well. There's enough low-speed damping to take the sting out at city speeds, but it's a busy motorcycle that makes it hard to ride for long periods. However, both the N1000 and the Z800 subscribe to the older Kawasaki design and the Z1000's looks just ooze menace and anti-social behaviour. But the Ninja 1000 is the same price and it comes with more space, better ride quality and a fairing though its styling is, admittedly, staid in comparison. The big ticket, though, is that in the same price as the Z1000 it adds traction control which makes it quite the bargain. Most importantly, out on the Indian highway, the Ninja 1000 feels like it's home and it isn't unwieldy in traffic either. As in wow. Non stressful.